We "sprung forward" this weekend, the weather patterns are shifting, and there are buds on our wisteria and asparagus in the markets. We are happy to see spring and looking forward to longer hours of daylight, warmer weather, and a some of our favorite produce. 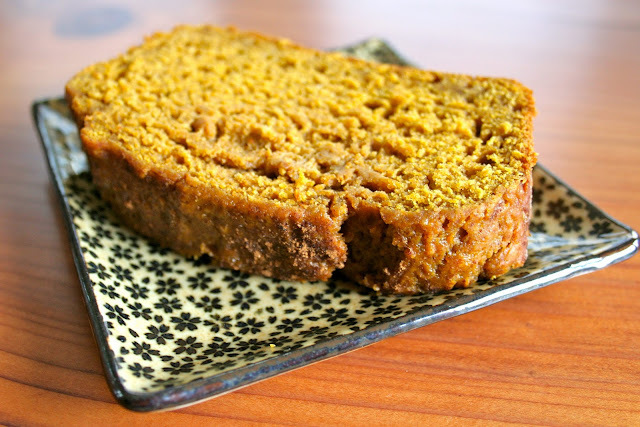 But before we go all into spring, we wanted to make one of our fall/winter favorites one last time: pumpkin bread. 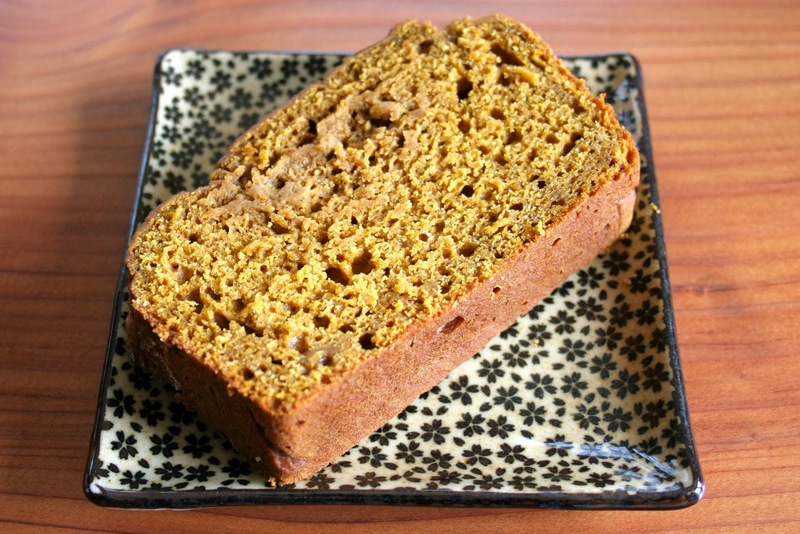 We've been working on this recipe for a bit, trying to make a quick bread with lots of spice and a little extra kick of freshly grated ginger and molasses, in addition to your standard pumpkin pie spices. We are very happy with the result, and hope you enjoy it too. Make it before blueberries come into season and you find yourself unable to resist blueberry muffins! Preheat the oven to 350. Butter and flour a 9" x 5" loaf pan. In a large bowl, mix the flour, baking soda, baking powder, salt, cinnamon, ground ginger and nutmeg. In another bowl, blend the egg, pumpkin, sugar, butter, oil, molasses, and buttermilk. Stir until well blended, then add the ginger and vanilla extract. Pour the wet ingredients into the dry and stir until just mixed. Do not over mix. Pour the batter into your prepared loaf pan and sprinkle the turbinado sugar and cinnamon over the top. Bake until a toothpick comes out clean (about 45 minutes). Let the pumpkin bread cool in the pan for about ten minutes, then remove to cool completely on a wire rack. That is one beautiful looking bread! Love the color and all those glorious ingredients!! Thank you so much Mary and Kelsey! pumpkin bread is my favorite ever! I love that you put molasses in it. I gotta get to baking before the sunshine comes and it gets too hot! Tina, we were torn between using molasses and honey for extra flavor, and I think molasses was the right call. It just goes with the pumpkin and spices so well - but you're right, it's definitely a cold weather flavor. Quick, eat some!